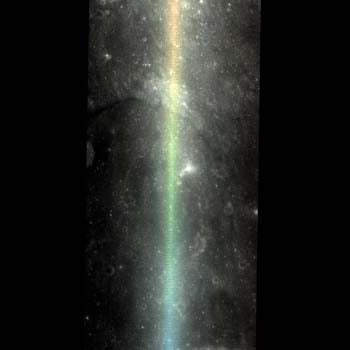 This rainbow on the moon is a combination of two factors. The first is an optical phenomenon that happens when the sun is directly overhead, the second is the filters on the Lunar Reconnaissance Orbiter. As the LRO circles the moon, taking pictures, it occasionally runs into a phenomenon known as an opposition surge. The opposition surge occurs only when the sun is directly behind the orbiter. This amps the brightness levels considerably, because the angle of the sun makes it impossible for the LRO to see any shadows on the ground, and as the sunlight reflects from the surface, it constructively interferes with itself. The wavelengths of light converge at their peaks, amplifying and amplifying. NASA offers an explanation as to why they form a rainbow. But why does the image above have a rainbow? Because each filter observes different pieces of the ground at different time, it observes the opposition surge at a slightly different time. When the observations from the separate filters are combined to a single color image, this shifting bright spot is seen as a rainbow. This is the same image, taken at a darker time of day.